I am one member of the Natural Wonders. We are a group who have been working with local flora to produce Dyes and Prints on fabrics and fibres. 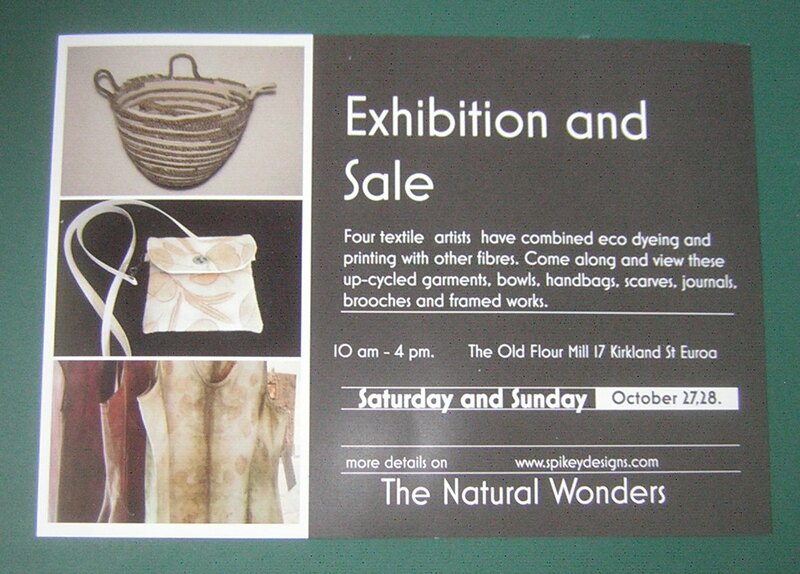 On the last weekend of October we are holding an exhibition and sale in The Old Flour Mill 17 Kirkland St Euroa. The Old Flour Mill is on the Western side of Kirkland St. The Caravan Park is to the East. 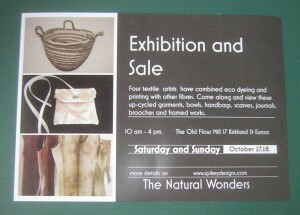 There will be up-cycled garments, fabric vessels, coiled baskets, journals, scarves, handbags, brooches and framed works. We are aiming to have lots of items under $50. This will cover those looking for lovely gifts and keepsakes of Australian flora. The inspiration for the works has begun with the eco dyeing, however other colours and fibres have been introduced to complement the designs. 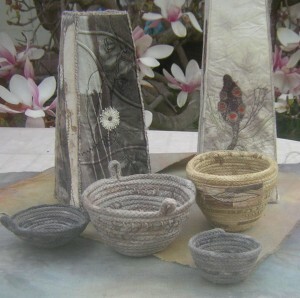 I have been dyeing cords and threads in the eco dye pots. Besides using the threads in my hand-stitching, I have added them to the coiled baskets. 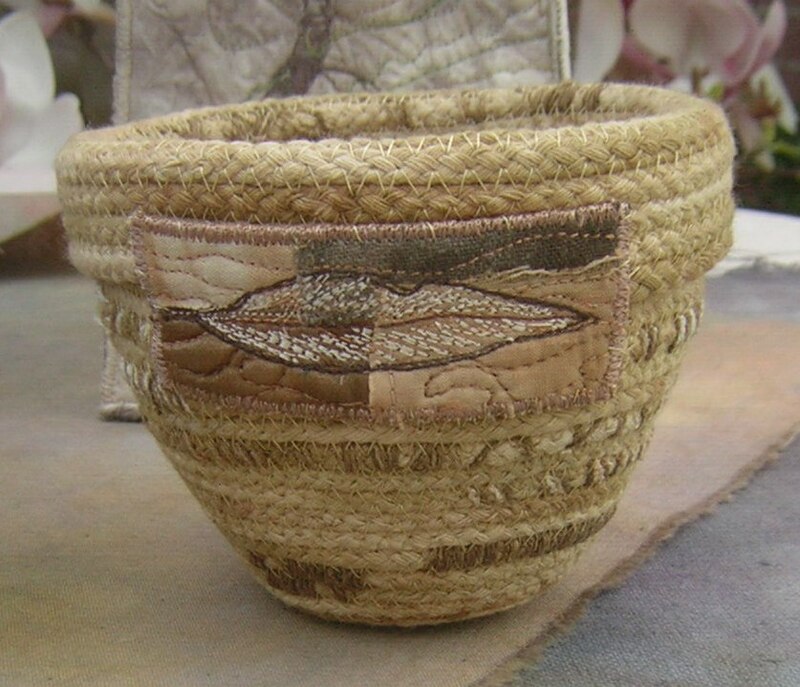 This little coil basket/pot has had the cord dyed with gum leaves and copper mordant. Extra threads have been wound around the cord as I have sewn it together. I finished off the pot with a free-motion stitched gum leaf, stitched over pieces of eco dyed silk. In some of the other bowls, I have put silk gum leaves on the inside. In one of the bowls, the design has been created with Inktense pencils, two others have silk gum leaves added. On the fabric vessels, the silks and cottons have been eco dyed. 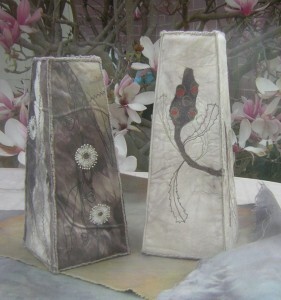 The shape has been constructed with bag felt. This makes sewing easier, as the machine needle copes with the density of the bag felt. Some other things I tried did not work so well or, whilst the machine needle might go through, hand stitching was a problem. 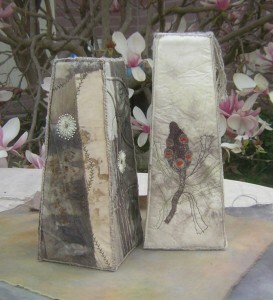 These two vessels have been designed to reflect the flora used in their creation. The vessel on the left, has a southern blue gum design worked over it. This particular gum prints and dyes beautifully. The leaves can be over 30 cm long and lend themselves to exciting designs. The silvery vessel has been dyed with Banksia blossoms. Once the blossoms have turned brown they pull apart easily and the little stamens give a lovely print. I have machine stitched (free motion) the design around the vessel. The bright russet inside the seed pods is a rayon thread. 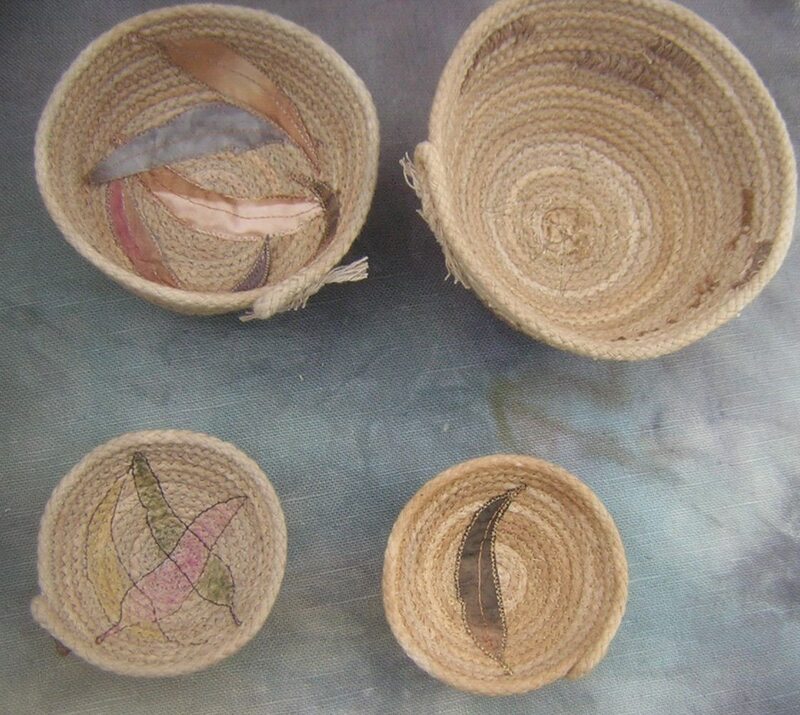 The little bowls can be used for Jewellery, keepsakes and treasures. The fabric vessels can be enjoyed as artworks and/or slip in a glass to hold flowers. The exhibition is open from 10 am – 4 pm. 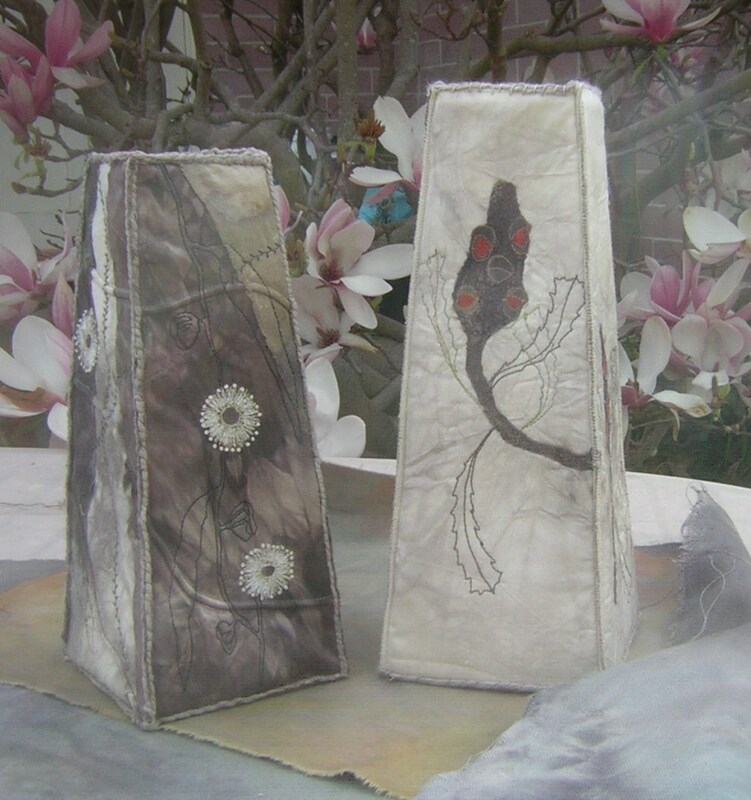 It adjoins an eatery so drop in to view our artworks and then enjoy a coffee and cake. 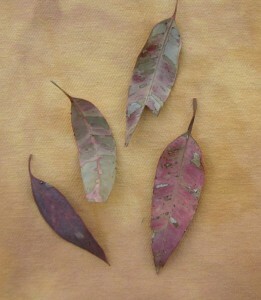 Out walking this week, I was finding fallen gum leaves in a fantastic array of colours. I picked up a few and brought them back to the studio. 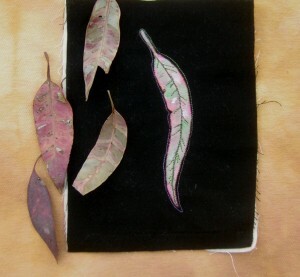 Using a pearl lustre base, I mixed up the colours of the leaves. Then I set about painting them. After the ink was dry I used an Elna press to heat set the ink. Some of the pieces I thread painted over the top. 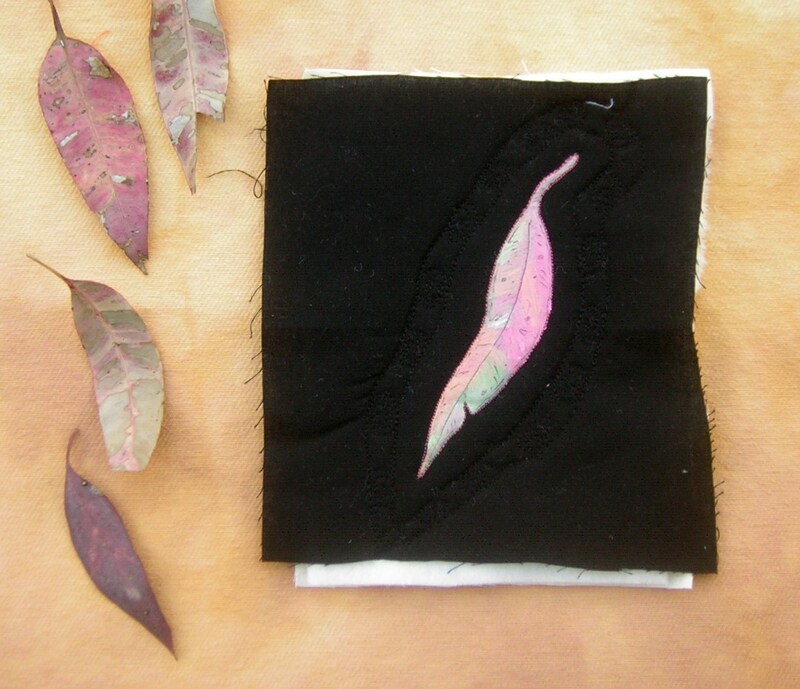 Others I quilted and then ran a sewn line around the perimeter and centre line of the leaf. I used rayon threads and Sulky 12 thread as well. Here are two walkers bags using hand painted gum leaves. 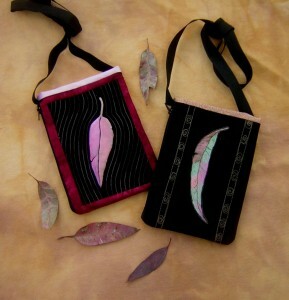 The first bag has echo quilting around the leaf. The second bag has two strips of free motion machine embroidery, which reflects the commercial fabric I used for the lining.